Free Download EnhanceMovie 3.0.9 - Video editor with powerful filters. Movavi EnhanceMovie is a simple video editor and video quality improvement application created for non-professionals to increase the quality of videos easily and quickly. It also allows to apply a number of filters and visual effects to add a professional touch. It supports a wide range of video file formats from popular ones (AVI, MPEG, WMV, VOB, IFO, and MP4) to less used formats (M4V, 3GP, 3G2, 3GPP, 3GP2, MOV, QT). To eliminate various video quality problems you can select from over 20 filters provided in the right part of the application. Auto filters can enhance video automatically by changing both lighting and colors (MagicEnhance filter), by intensifying colors (AutoSaturation), by calculating the best contrast for the frame (AutoContrast) and correcting white balance (AutoWhiteBalance). Customizable filters which allow you to specify the desired level and parameters of the improvements you introduce include brightness, contrast, gamma correction, blur control, sharpening the video, deinterlace, setting up the color temperature and hue/saturation, color balance (for shadows, midtones and highlights), chroma balance, denoiser and deblocking. Video effects will turn your home video into a professional looking movie. Insert video transitions between episodes to make your movie well-paced, without abrupt changes. After applying filters and visual effects, you can preview the results in the built-in video player. The video editor includes a number of other useful tools. It can cut and join videos, capture video from MiniDV or from a web camera, prepare video for various mobile devices: Apple iPod, iPad, Creative Zen, Archos, Sony PSP, Blackberry, and other tablet computers/ cell phones. You still think that editing video is a tricky task, done by professionals with the help of expensive and incomprehensible software? 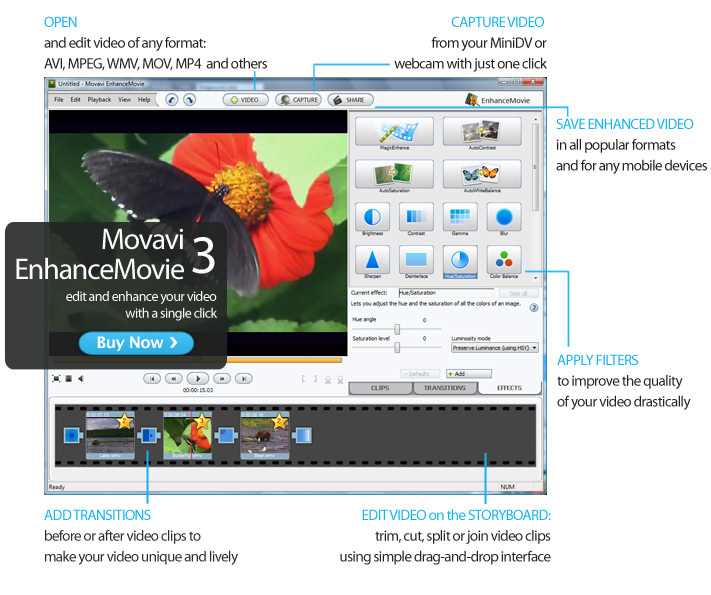 Download and install the free trial version of Movavi EhnanceMovie and see how easily your video can be improved!